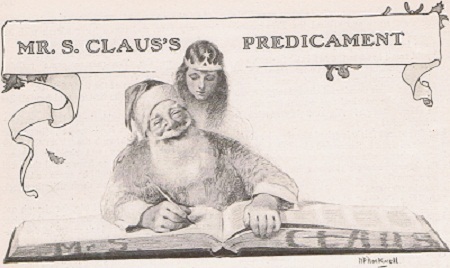 Mr. S. Claus's Predicament, illustrated by Norman Rockwell, appeared inside the December 1915 issue of St. Nicholas on pages 164 through 167. Rockwell painted three illustrations for the story. 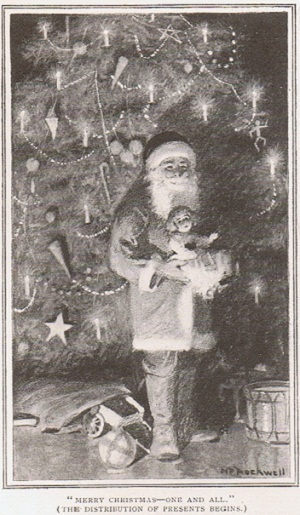 St. Nicholas was a popular children's magazine of the time. The story is actually a Christmas play, starring Santa Claus and the Snow Queen. The plot basically concerns a year where there is no snow. How will Santa and his sled pulled by reindeer ever deliver all the candy and toys on Christmas without an abundance of snow. He appeals to the Snow Queen for help with his predicament. The three illustrations were also reproduced in Norman Rockwell, A Definitive Catalogue by Laurie Norton Moffatt on pages 743 and 744. The location of two of the charcoal and gesso on paper illustrations are not known. The third is part of a private collection. Ladies and gentlemen - and grown-up people: This evening we are going to present a sensational and scintillating spectacular drama entitled "Mr. S. Claus's Predicament." This is the first time it has been given on any stage in the world—also the first time in America. It has been put on at tremendous cost, and Santa Claus has been engaged especially for this production, regardless of expense, on this the busiest night of the year for him. We want to say that we have with us to-night the only real, genuine, authentic Santa Claus. We are pleased to be able to give this show before so stylish and handsome an audience. ln fact, on looking at you all a second time, I see that you are the politest and most intelligent company that ever came together to see a play. Therefore we shall ask you to be kind enough to keep your seats until the end of the show, and please do not throw anything, except bouquets, at the actors. 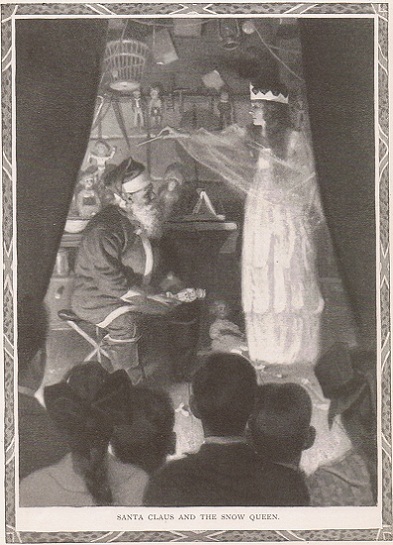 The first scene shows Santa Claus in his workshop at the North Pole. and his friend. the Snow Queen, calling on him. After that you will be able to follow the plot yourselves. SNOW QUEEN (speaking off the stage). Good-by, North Wind, good-by. SANTA CLAUS. Evening, Snow Queen! SNOW QUEEN (entering). Evening, Santy! SANTA CLAUS. Howdy! Step right into the shanty. But none that threw me such frosty kisses. SNOW QUEEN (laughing). Oh, Santy! you joker! SANTA CLAUS (motioning to the wand). ]ust stir up the fire a bit with that poker. I'd melt, and your little Snow Queen would expire. SANTA CLAUS. Oh, yes, I know, Snow Queen, you're made out of ice. SNOW QUEEN. I love to be cold. SANTA CLAUS. Well, you 're chilly - but nice. Putting cold breezes up sleeves and through blouses. They tell me it feels like the middle of May. It must be nice for the automobiles. If the roofs around Haworth are n’t covered with snow? And spread a snow - blanket deep over the town. To all those dozens of girls and boys? Who all of them are - as you do each December. And how they behave—in these little books. Let ’s see! Here ’s Jack and Beth, and Pink. They ’re all in here - oh yes - how jolly! SNOW QUEEN; Have all these children been very good? If they ’d seen that book they surely would. SANTA CLAUS (producing a book about an inch sqnare). There are n’t many bad ones - just this minute. This book is for them - (laughing, and speaking behind his hand) but there are n’t any in it! You never have to speak to them twice. I ’d take them candy and toys in loads. SNOW QUEEN (going to the door and waving her wand). North Wind, come quickly! I ’ll see, Santa. dear, you have plenty of snow. The ground will be white wherever you go. And give you good sleighing. Dear Santa, good-by! SANTA CLAUS (as Snow Queen starts to go out). Give each sleeping youngster a nice Christmas dream. SNOW QUEEN. Tired of waiting! Asleep in their beds! I must put some beautiful dreams in their heads. SNOW QUEEN. No candles? That is tragic! This is the time for magic! (waving her wand). Santa Claus is here to-night. SANTA CLAUS. Phew! That ’s a warm welcome, sure enough! Suppose I 'd stuck with all this stuff? With gifts for Molly, Beth, and ]ack. And one for you - behind that chair. Then - Merry Christmas - one and all! 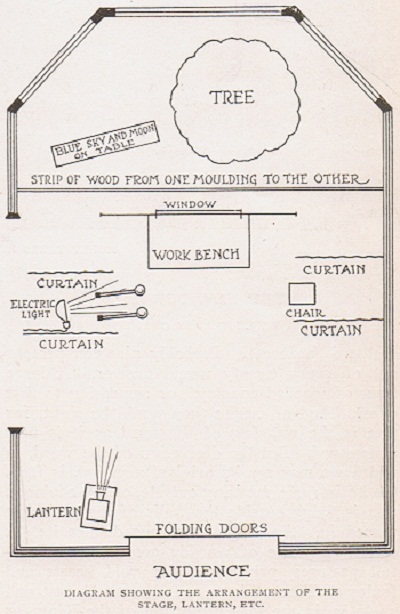 An ordinary parlor can readily be arranged as shown in the following diagram, A light strip of wood extends across the room, about half-way to the back of the stage. From this sheets are hung, at the right hand to hide the tree in the hrst scene, and across from side to side for the second scene. The scenery for the workshop, in the original production of this play, was built out of wood 3/8 inch thick, and made in adjustable parts, so as to be set up and taken down quickly. The window was an old piece of narrow sash laid lengthwise, originally intended for a small storm window. Cotton and artificial snow were arranged on the panes to resemble real snow. The wall can be stained brown - the weathered white of the sash makes a good contrast, and the bench can be left the natural color of lumber. The moon and sky are made by pasting blue and white tissue-paper over a box with a light in it. The floor is strewn with shavings. The fireplace is arranged by having a pair of andirons project from between two curtains; an electric light bulb, covered with orange tissue-paper, placed between the andirons out of sight of the audience, gives the effect of firelight. The light for Snow Queen’s wand should be a 3½-volt bulb, which can be bought at any electrical store for ten cents. Use a five-cent pin-socket and magnet-wire. Wind the wire around the wand, and paste silver paper over all. Cut one wire at the point where the hand comes and attach the two ends to a skeleton push-button, which can be readily fastened to the wand with a rubber band. Then lead the wires up the Queen’s sleeve and down to a small candle-battery fastened at the waist on a belt. Opaque bulbs in the form of flowers are very pretty for the tree. They are sold at electrical stores in sets of eight, and can be attached to the house-circuit. The person who switches on the lights in Scene III should, of course, be concealed. Reflecting lanterns, which can be used on the electric circuit, and which will project, in its correct colors, any picture put in them, can be bought in camera stores. electrical stores, and toy-shops, at from three to fifty dollars. Jessie Willcox Smith’s illustrations of the poem are very effectively shown in this way. A drop-curtain can be easily contrived with a couple of breadths of denim or some similar material, a few nails, some screw-eyes, and a ball of twine. The lantern should be used as a spotlight when the Snow Queen enters in Scene I and should be kept on her and Santa Claus to reinforce the firelight. Santa Claus wears long rubber-boots, a red coat, trimmed around the edges with white "fur" made of cotton, a long white beard, a touch of rouge on each cheek, and a stripe of “clown’s white" on each eye-brow. These paintings was only one of many Norman Rockwell paintings. The Snow Queen has long golden hair, and wears a flowing white gown trimmed with cotton and sprinkled with artificial snow. On her head is a crown of pasteboard covered with silver paper. She carries a silver wand with a small electric bulb in the end of it. These illustrations were, as you can tell, painted at the beginning of Norman Rockwell's career. He was even still using his middle initial to sign the works.